This is the baby of the commercial range, adapted from the mid range domestic model (F70), this has a larger water tank and larger waste coffee compartment for higher usage. This is a super little machine, doing essentially everything the larger machines do but in a compact design with lower output. Now, fabulous coffee comes to the office. Apart from making a top-quality cup of coffee, the new machine is unusually designed and has a clear-cut operating concept, with all maintenance at the touch of a button. 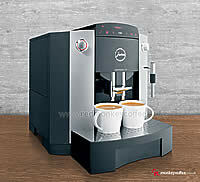 Where a daily capacity of around 30 cups is called for, the compact IMPRESSA XF70 has got what it takes. No Mains Plumbing Option - This model can not be plumbed into the mains water supply, can only be used by hand filling water tank, this also means you will need to use Claris Water Filters. No Twin Boiler - This doesnt effect function on speed of the machine, you will have a delay of around 20-30 seconds when switching to and from coffee despensing and milk frothing, no delay on Z5/X5, X7 or X9. Suitable Use: office, bar, restaurant, hairdressers, conferences & seminars, car showroom, meeting rooms, receptions and there is no reason why you cant have it in your home!. Note: This machine is not suitable for coffee shops, it is not intended nor would the warranty cover it for constant heavy commercial use every day, if you require a machine for over 50 cups we would recommend the Jura X7 or X9 models. All the machines can be used to whatever level you wish and there is no reason why they would not handle it but if a fault occurred the warranty may be invalid which would mean the repair would be chargeable, the machines log the number of cups produced. If you wish to use the IMPRESSA XF70 to make coffee specialities, it couldnt be easier. Operating elements are reduced to a minimum and clearly understandable. Simply turn and push to navigate intuitively through the entire range  the Rotary Switch makes it all possible. Easy Select© gives you coffee à la carte completely to your own personal taste. The touchscreen provides nine programmed coffee specialities while Easy Select© offers two different aroma and temperature levels. This effectively means you have 36 different types of coffee to choose from. Thanks to its compact dimensions, the machine fits in virtually anywhere and is an attractive feature of any room. With a great deal of care and love of detail, designer Wolfgang Jönsson has turned every side of the IMPRESSA XF70 into a genuine eye-catcher. Image shows difference in size between old X95 model. If you have a longing for a cup of tea, satisfy it with the programmable tea portion function. The Connector System© allows you to use a water jet and Red Monkey Coffee's Free Included Professional Cappuccino Frother. The IMPRESSA XF70 comes into its own when you want to make something like 50 cups of coffee specialities a day: in offices, car showrooms, boutiques or hairdressing salons, for instance. It is maintained and ready for use in seconds. All you have to do is concentrate on essentials - like enjoyment. Needless to say, you can also use a second, pre-ground coffee blend: thanks to the powder dispenser monitor, the intelligent electronics recognize it automatically. Not just the coffee strength but also the water volume and temperature can be set to suit your personal preference. The height can slide between 70mm and 111 mm. This permits adjustment to accomadate different cup heights. The crema is preserved and no coffee splashes onto the appliance. The Impressa XF70 offers three different integrated cleaning programs: a coffee sector cleaning, auto cappuccino cleaning and combined cleaning programs. Also de-scaling programs also available but should not need to be carried out if Claris Water Filters are used. 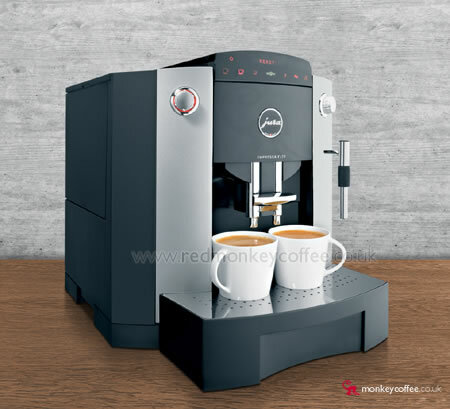 At Red Monkey Coffee we have broken it down for you so you can see exactly what extra you get on each model & what is the standard, remember its also the look, design and style of the machine which is one of the biggest differences, the XF70 is a more compact machine design with modern looks. The XF70's Features, both the Z5/X5, X7 & X9 have higher specs/better features.  Volume of waste grounds max 30 portins can be held before needing emptying. 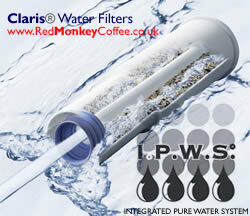  I.P.W.S.© (CLARIS water filter cartridge system) Filters the water to purify and remove the causes of lime scale and makes the coffee taste better as the water is purified.  Auto-Cappuccino - Frothed & Steamed milk dispensed into cup direct from milk container, no more frothing in jugs.  Programmable powder quantity 5-16g, brewing temperature, on-off time, water hardness. Setup: This can not be plumbed in to the mains water supply, only hand fill. It requires no plumbing, wiring, waste, regular outside servicing or training the machine is self maintaining with cleaning & decalcifying cycles performed by yourself with tablets, the machine will tell you when these need to be carried out. Times for cappuccino, latte etc are dependant on how long you take to dispence/froth your milk, this is automatic without moving your cup on the X5/Z5, X7 & X9. Free 2 Kgs of different Red Monkey Coffees, our own quality fresh roasted coffees, not like other cheap stuff, you, your collegues & your customers will appriciate it! Dont like these free extras? No problem, give us a call 0870 207 4831 or email and apart from the delivery we can change any items for whatever you want from our site upto the same value, all part of Red Monkey Coffee's service. Plus pay by DEBIT CARD, Cheque or BACS & get an extra 1Kg of coffee or £15 extra credit to apply to accessories!